Look up in the sky on a sunny day, and you will see the nearest fusion reactor to the earth! The goal of controlled fusion research is to create a miniature star in the laboratory, and to try and harness the energy that is released. Nuclear fusion occurs all the time in the interior regions of stars. In the process lighter nuclei fuse together to form heavier nuclei and release tremendous amounts of energy, thus heating the interior of the star. Since the mid-1950's a world-wide effort has been underway to demonstrate controlled fusion in the laboratory. Reaching fusion conditions is not easy, since it requires requires reaching temperatures in excess of 50,000,000 deg C (!). As you might imagine, matter as we know is ceases to exist at such high temperatures. Instead, the fusion fuel becomes ionized (that is, the electrons and atomic nuclei are torn apart and form an electrically conducting gas). Other places where plasmas exist include the sun, inside flourescent and neon light bulbs, ion rocket engines, and plasma processing devices used to etch semiconductor materials. Since plasma is electrically conducting it can interact with electromagnetic fields (generated by electromagnets, microwave and radio-frequency sources, and lasers). How are the required conditions generated in the lab ? Previous research has identified two promising approaches: magnetically confined fusion, and inertially confined fusion. The latter approach uses large, powerful lasers or particle beams to illuminate a small target of fusion fuel and quickly (less than a billionth of a second) reach fusion conditions. If you are interested in learning more about this concept you may jump to the National Ignition Facility Homepage for a more detailed discussion. The approach advocated by the LCT research program has grown out of the magnetically confined approach. The basic idea in this approach is to use ... The LCT approach makes a radical departure from the traditional magnetic tokamak in that the motion of plasma particles is no longer governed solely by magnetic fields, but instead is governed by both electric and magnetic fields. The magnetic mirror scheme used a linear array of magnet coils to form a "magnetic bottle". In this scheme, the magnetic field at the ends was made much stronger than the magnetic field in the middle of the chamber. As a result the loss rate of plasma from the ends of the magnetic bottle is reduced. However, most researchers today believe that this approach cannot be made to produce net power; thus most research on this scheme has been stopped. The Stellarator concept was invented in the 1950's in the US, and used a complex set of coils to produce a toroidal magnetic field (i.e. one that is shaped like a donut). In a stellarator the magnetic fields needed to confine the plasma are all produced with external magnet coils; thus stellarator devices can be operated in the steady state. Large stellarator experiments are active in Germany (W7-AS), and two new larger stellarator experiments are in the construction stage ( the W7-X device in Germany and the superconducting LHD device in Japan). The tokamak forms the basis of the dominant magnetic fusion scheme in the world today. The tokamak concept also depends upon a toroidal magnetic field. However in the tokamak a significant plasma current exists which also plays an important role in generating the magnetic confinement. 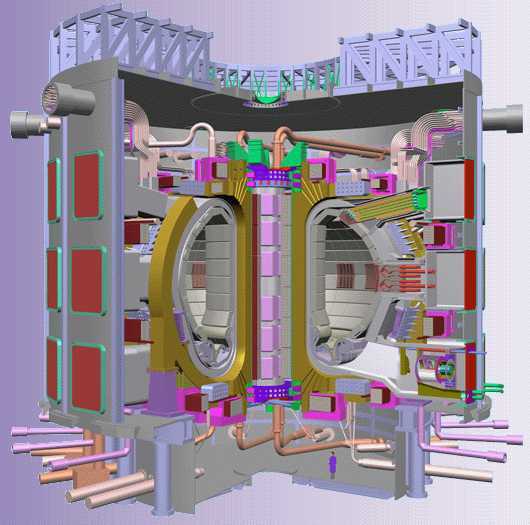 Because of the need to sustain this plasma current, the tokamak is usually a pulsed device (although techniques for making it into a steady device are under development). A tokamak is a toroidal plasma confinement device invented in the 1950s by the Russians Tamm and Sakharov (yes, the famous one). The word "tokamak" is a contraction of the Russian words: "toroidalnaya", "kamera", and "magnitnaya", meaning "toroidal chamber-magnetic." The plasma is confined here not by the material walls (which wouldn't be compatible with a plasma which will be millions of degrees Celsius), but by magnetic fields. Physicists have been working since the 1950s on making better "magnetic bottles," a problem which has been compared to holding jello (the plasma) with rubber bands (the magnetic field). The magnetic fields in a tokamak are produced by a combination of currents flowing in external coils and currents flowing within the plasma itself. This contrasts to a similar concept, the stellarator, in which all of the confining magnetic fields are produced by external coils.